Fly Eagles Fly!! 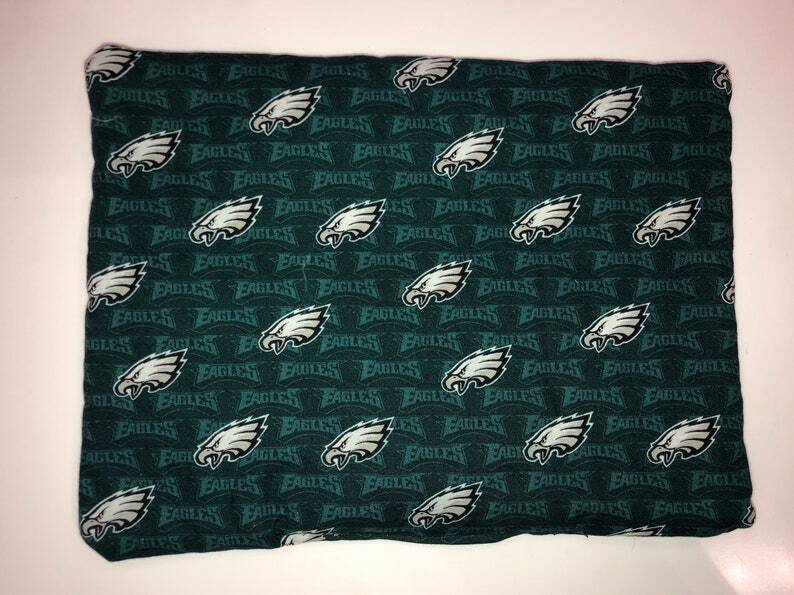 Catnip mat has Eagles logo with Eagles lightly in the background on the front with a solid black backing. Catnip mats come in various prints and 2 sizes* 12" x 9" and 9" x 6". Catnip is organic and in the front and back of mat. Although I have two cats, I’ve only seen one react favorably to catnip, so I opted for just one of these adorable catnip mats. That was SUCH a big mistake. Both cats fell in love with the toy and like one might expect, they’re horrible at sharing. The toy itself is super well-made (thank goodness—because my shyer kitty is apparently a spastic kicker when he inhales enough catnip!) and the stitching held up to even the toughest/roughest love. I don’t know how much the cats care, but the witchy print on the Black Cat mat is so cute and thankfully durable enough for all the kitty drool. I strongly recommend getting a couple *per cat* in your life. It was so worth it to see my shyer, straightedge kitty lose their mind over the mat... I’m going to stock up! Adorable and well made! My cat just loves this pillow. This was my first time ordering these catnip mats and I’m so glad I did! They were definitely the favorite gifts this Christmas and both of our cats couldn’t get enough of them!!! I highly recommend ordering from this shop and will definitely be purchasing more in the future! Order will be cancelled if item isn't paid for. Please notify if item is damaged asap so we can make arrangements to have item repaired or replaced. Any items that need to be shipped back to me buyer is responsible for those shipping charges. Items are shipped USPS Priority mail unless otherwise noted. Custom made items may take longer to make/ship and cost a more depending on material used. I will make sure you are aware of items status at all times! Squeak toy does have a physical squeak inside!! Please make sure for the safety of your pet you check for any bigger rips or tears as it can be a choking hazard! We don't want anyone to get hurt!! Please keep in mind these are made of cotton fabric if you have a heavy player that loves tug of war these might not survive! !